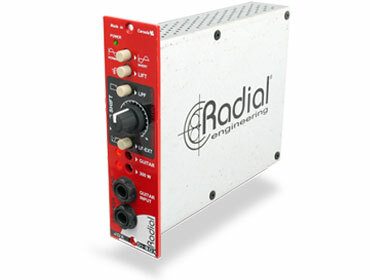 The Radial JDX™ Reactor™ is a unique guitar amplifier interface designed to capture the tone of a 4x12 cabinet by either recording 'direct' or by interfacing the Reactor via an amplifier head and cabinet. This makes the JDX ideal for fast-paced recording environments such as film and gaming where take after take consistency is required. But don't let the high-speed production capability lead you to think compromise… the JDX is used by many of the world's leading artists including heavy metal master Kerry King of Slayer, Rascall Flats, Radiohead and Dimu Borgir just to name a few. The most astonishing results are obtained when patching the JDX in between a head and cabinet. The JDX captures the sound from the head while the reactive load captures the back electro-magnetic impulse from the loudspeaker. Advanced multistage filters shape the tone to emulate the sound of a 4x12 half stack. For quick tracks and overdubs, you can plug your guitar into a distortion and then into the JDX and get a great consistent sound without having to move mics around or trying to manage variables such as room acoustics and amp levels. 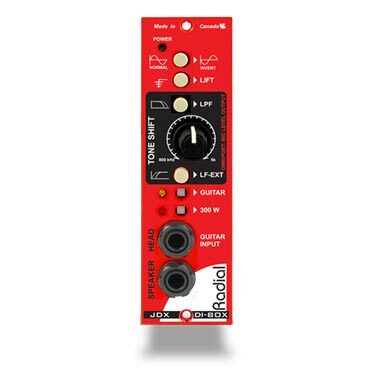 And with this new 500 series module, bass amps can join into the fun! Use the standard 4x12 emulation to capture the robust mid-range tone of an SVT or power-up the bottom end using the low frequency extension . Choice of 100 and 300 watt settings are available. The on-board low-pass filter gently smoothes the top end to tame overtly bright amps. The JDX employs 100% discrete electronics and transformer isolation to create the analogue tone and the 500 series modular format makes it super easy to Reamp™ a track and warm it up. As with all Radial 500 series modules, the JDX is backwards compatible with older racks while integrating all of the new capabilities found in the Workhorse including direct connection to the mix buss and the Omniport , which in this case is designated as a direct box out to capture the live performance.